Time for another dash of miscellaneous miner tears from the Grab Bag. Can you believe we're already to our tenth edition? Judging from the volume of tears generated thus far, we'll be in the triple digits in no time. Our vacation to Tolle means plenty of new people to teach the Code. But by now, we're well prepared. With a stable of helpful blog posts, every question has a detailed, professional answer ready to go. I'm not sure I've been compared to the Taliban before. Probably, but Sheron Cristal had the courtesy to run through the obligatory Nazi reference with good speed. For all the miners who complain about the Code, I have yet to meet a miner who could come up with an idea for improving it. 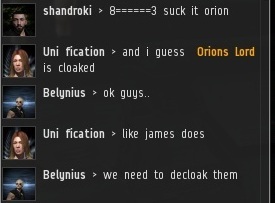 On the other hand, we usually get decloaked anyway in the course of our miner-bumping duties. By bumping miners. At first blush, you'd think mack1 was just your average space lawyer spouting the same old lines. Now there's a new one. 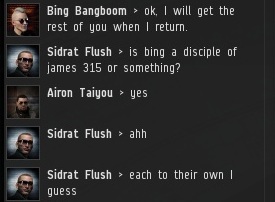 Does anyone know about the "three guys" going to jail for poor EVE conduct? 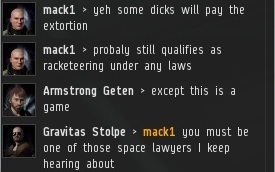 More space lawyer creativity. 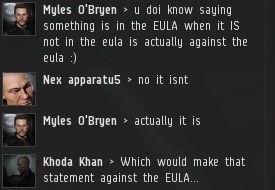 If it were against the EULA to wrongly claim things are in the EULA, I know quite a few space lawyers who would get banned. And then who would try all the space cases? 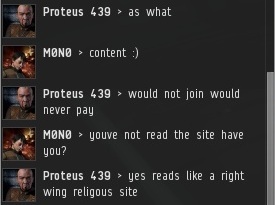 It's true, some miners are closed-minded when it comes to the New Order. 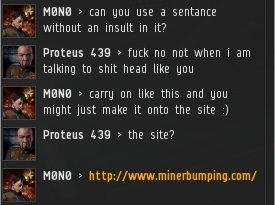 MinerBumping dot com is an excellent tool for winning hearts and minds. Actually, I think extremist groups would be more likely to ban us than embrace us. Did you know that when you play Halaima backwards it says "Am I Alah?" We close on a hopeful note. Sidrat Flush expresses a surprising degree of tolerance. We'll need him to join the New Order of course, but still, tolerance is a good first step. 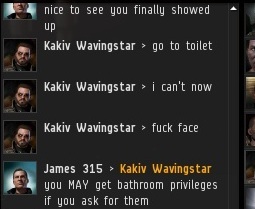 I had the pleasure of speaking with mack1 for a few days, I got to know him and thought after a delightful chat I would show him some some love and give him 10 million isk to buy a permit. 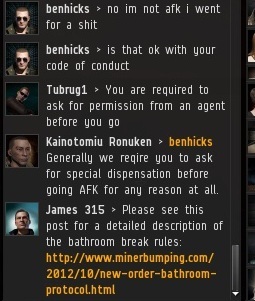 he refused to make the decision himself and sent me the money to make the decision for him so i promptly bought him a mining permit. http://imgur.com/QKgs1 sad though he lost it after less then an hour. 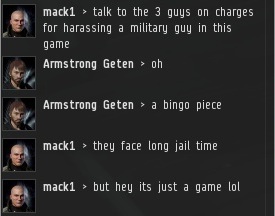 Mack1 is a particularly difficult case, not only does he refuse help from fellow miners (o7 Crab)but but he actually believes the crap he spouts. Where I had read previously on this very blog that Audrik Villalona (featured in one of your screenshots here) was a self-declared enemy of the New Order, Agents who frequent the Tolle system today may know that he is one of the New Order's staunchest supporters among the residents of Tolle, often attempting to enlighten fellow miners in Tolle local chat about the Code, and mining in full accordance with the New Halaima Code of Conduct - at the keyboard and mining what I find a most reasonable amount of ice. Truly, such is the power of the Code, that when presented with it's simple truth, many such as he begin to place their support behind the Code and it's messengers, the Agents. 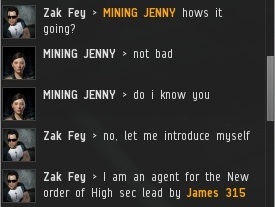 It is a shame that more miners do not follow the same path as he, embracing the New Order instead of mounting a futile resistance. LOL AM I ALAH? 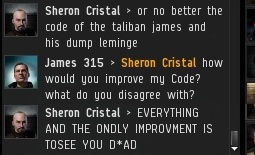 i cracked up when i read that, great work james315. Yeah I'm famous (Sidrat Flush). I think you're too tolerant to be Taliban, Nazi or religious zealot. Mack1! Hero of the resistance!